UNESCO has finally accepted the historical fact that the so-called Western Wall (Wailing Wall) had nothing to do with Judaism. It’s remains of a Roman fortress wrongfully adopted as a religious structure by the Jewish colonists. The same applies to the Al-Aqsa Mosque complex which the mostly atheist Zionist Jews claim to be as their holy Temple Mount (King Solomon’s temple). On Friday, UNESCO in Resolution 39 COM 7A.27 refused to accept Judaism connection to the Western Wall and Temple Mount while calling the Zionist entity an occupying power in the Old City of Jerusalem. The resolution condemned Zionist regime’s actions in the disputed Eastern part of Jerusalem, the West Bank and Gaza Strip occupied by Jewish army in June 1967 war of aggression. It also accuses Israel of planting Jewish fake graves inside centuries-old Muslim graveyards, and faking many of Islamic and Roman remains into old Jewish praying places. The resolution also criticizes the Zionist entity for its decision to build an egalitarian prayer area in the Western Wall area and for illegal measures against the freedom of worship at the Muslim religious sites of worship at the Al-Aqsa Mosque complex. The resolutions refers to the cities of Hebron and Bethlehem as solely Muslim, and raps Israeli control over the Tomb of the Patriarchs and Rachel’s Tomb, both in Hebron. 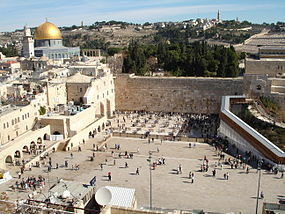 The resolution also renamed the so-called Western Wall Plaza to Al-Buraq Plaza. On Saturday, the Israeli ‘historian’ Benjamin Netanyahu, who last year had claimed that Mufti of Palestine made Hitler kill 6 million Jews, called NUESCO resolution ‘absurd’, as it ignores fundamental part of Jewish history. Ernest L. Martin, PhD, in an investigative article, entitled, The Strange Story of the False Wailing Wall, refuted Zionist colonialists’ claim over the Al-Aqsa Mosque. “There is absolute proof that the present site of the Jewish Wailing Wall is not any part of the Temple that existed in the time of Herod and Jesus. In fact, that particular location that the Jewish authorities have accepted represents the western wall of an early Roman fortress. King Herod called it Fort Antonia, after the famous Mark Anthony who lived at the end of first century before Christ,” Martin claimed. On November 25, 2011, UK’s Jewish Daily Mail reported that two archeologists with Israel Antiquity Authority, Eli Shukron and Ronny Reich found 4 coins which confirmed that Holy Western Wall was not built by Jewish King Herod as claimed by Jewish historians for centuries – but was built 20 years after Herod’s death. On December 10, 2015, British veteran Jewish writer, actor and director Stevphen Berkoff, penned an Op-Ed for Israel’s top British Hasbara organ,Jewish Chronicle, saying: Why is there such an important need to step into the place where once the Jewish temples stood? It has gone, gone, over 2,000 years ago. Get over it!